Ann Handley, of Marketing Profs fame, and I have often discussed how one of the most significant achievements of the Web 2.0 Revolution has been the overthrow of the editor. For years, these gatekeepers determined what we read and, more importantly, what we didn’t read. Whether it was a magazine editor rejecting stories because the writer was unknown or a newspaper editor rejecting letters because they’d already vetted the two “pro” letters they planned to run, getting one’s name into print and in front of the masses involved overcoming significant hurdles. The editor was an all-powerful judge. There was no transparency, no way of knowing what criteria were used in accepting or rejecting articles, letters, even TV shows. The editor was supposed to have a higher level of taste and to be an expert in predicting both the audience’s desires and enhancing the publication’s status. But reality was more like a game of follow-the-leader: editors (of all stripes) tended to hew to a very specific formula and had limited incentive to let new voices in. There was also the intimidation factor: many people did not submit to publications (or TV networks) because they were afraid of rejection: they believed the editor did, in fact, know best, and that a rejection meant they were no good. Just as many were unfamiliar with the intricacies of submission (and believe me, they were intricate) - such things were purposely kept shrouded in an air of mystery to discourage the great unwashed from overwhelming the gatekeepers with their submissions. Now the Editor’s Selections comments are generally erudite and display more than a passing familiarity with logical reasoning. But they’re also the editor’s selections. So that once again that gatekeeper is in there, deciding what the masses should see and what they shouldn’t. That scares me, because it’s so counterrevolutionary. It’s as if the Times couldn’t wait to restore the ancien regime where the aristocracy knew what was good for the peasants and told them so. Democracy is messy. That’s as true in politics as it is in content. But it’s the only way to ensure that all voices are heard and that the hierarchies that cause societies to ossify and eventually wither, don’t come back into place. 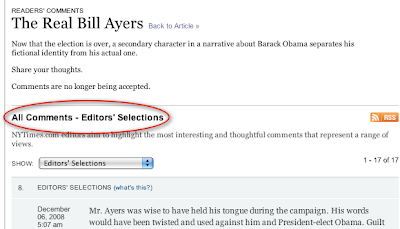 In other words, I wish the Times had the second tab in their comments section - “Readers Recommendations” show up first. That would be keeping in the spirit of the revolution.